“When I got engaged, I was excited to finally shop for my wedding dress. I knew exactly what I was looking for as I had the concept in my head ever since I can remember, so I thought the process would be a breeze. Boy was I wrong! Being a very particular person and after 3 failed attempts at local bridal shops, I knew I had to seek other options. I reached out to Stesha in hopes that she would be the one to put my concept to life and most importantly, within my budget. As my first experience with a custom bridal designer didn't go so well, I was a bit discouraged to give it another shot but knew I had to since the work on Stesha's Instagram looked amazing. 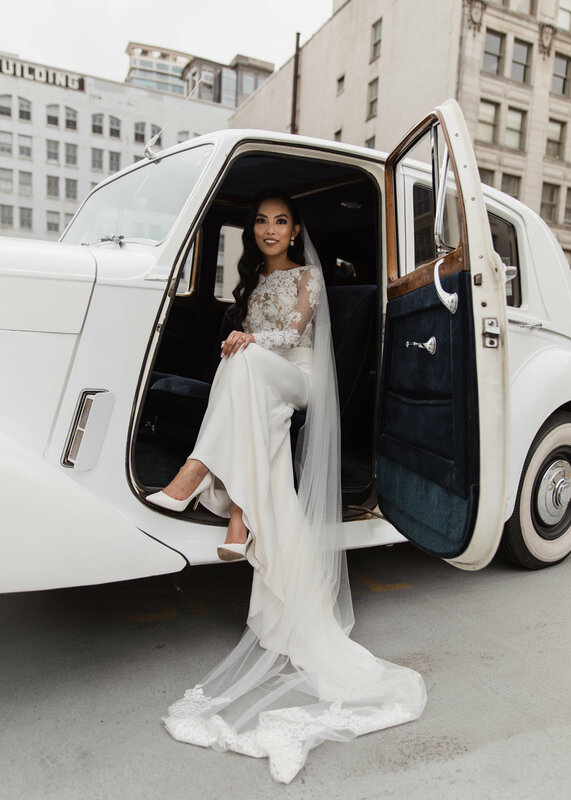 Photography by Hera Studios Inc.
"My wedding dress was definitely one of the most important things to me when planning my wedding. After having the opportunity to see Stesha’s work first hand, I knew she was the perfect person to design my dress! "Thank you so much for creating the dress of my dreams. From the moment I learned that you had created and worn your own wedding dress, I knew that I could trust you with my dress. Working with you was a wonderful experience. I enjoyed our meetings and felt that you knew what I was looking for and would execute it perfectly. Our general aesthetic styles aligned so that helped too. I respected your honesty on what would work and what wouldn’t, and trusted your knowledge and experience in making recommendations and suggestions. 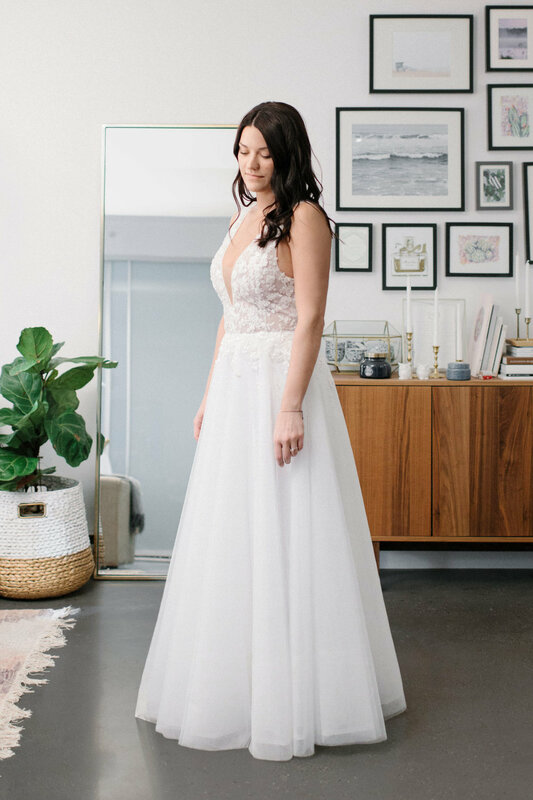 "The idea of having a high quality and hand made gown that was unique to me was so appealing, I couldn’t resist. But I had no clue what I wanted which probably made me an incredibly difficult client! Fortunately, Stesha has both the incredible skills and creative vision to custom make AND design wedding gowns! Even when I was incredibly indecisive she was patient and understanding. Eventually Stesha designed for me a stunning wedding dress that I absolutely fell in love with and never would have thought of for myself! The sheer lace deep-v was both romantic and modern. The mermaid gown silhouette hugged my curves and fit me like a glove! The tiny hand sewn jewels and elegant buttons in the back were delicate yet gorgeous. 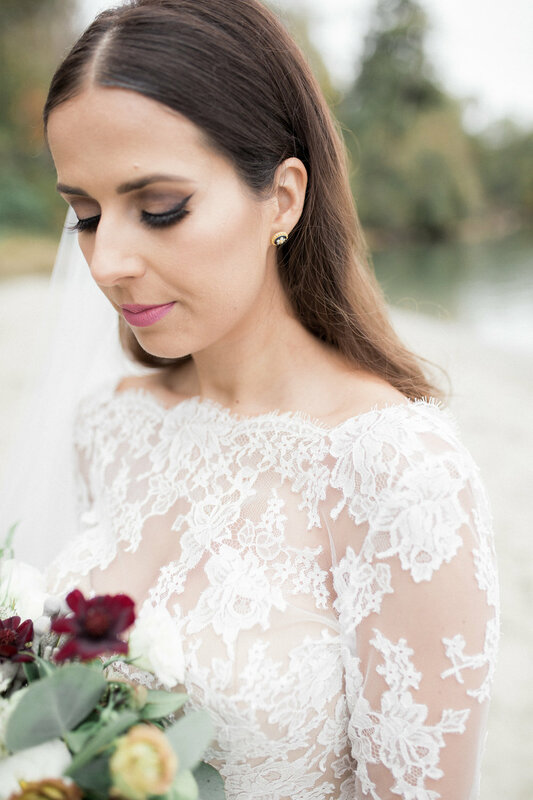 The attention to detail was incredible and it amazed me how such an ornate dress could be so comfortable and lightweight!